David Bowman is a physicist based at Royal Holloway in England, interested in exotic magnetism and narrative design. Fallout 4 wants to do a bit of everything, dabbling in crafting, town planning and perhaps most interestingly, political commentary. This can be found in the emails on long dormant business servers that exist to give motive to the corporate malfeasance that starts in the now abandoned laboratories and ends with the destruction of civilisation. This is a game that is set in two different times: before The Bomb is dropped and after. The problem, however, is that despite what at first glance appears to be a complete overhaul of society between these two periods, the structure and ideology of the pre-Bomb world is entirely reproduced after it. When the Sole Survivor wakes up from their cryogenic slumber 200 years after The Bomb has been dropped on their native Boston they stretch their legs, pick up a gun, and wander out into the wasteland in search of their missing son. To the player the desolation, the violence, and the isolation may at first be signs that this is a dystopian world and indeed, this is the spectacle they have paid to be admitted to. However, to the Sole Survivor this is barely worth mentioning. They make no remark on the skeletal remains of a human stretched out on the floor of a diner otherwise populated by living people, they are unskeptical of the still-fuelled vehicles sitting just as they always were on the streets of the city, and they are likewise unsurprised that no one thought to tidy up. This is because the Sole Survivor is the first person to live through the end of history. The anthropologist Claude Lévi-Strauss, writing in his 1955 work Tristes Tropiques, bemoaned that the spread of Western civilisation has replaced a diversity of culture with identikit suburbs and shanty towns: ‘Mankind has opted for monoculture; it is in the process of creating a mass civilisation, as beetroot is grown in the mass. Henceforth, man’s daily bill of fare will consist only of this one item.’ That is to say history would appear to be in a process of convergence where the old and the new become indistinguishable; history as concept no longer serves as a means of differentiation. The Sole Survivor falls asleep in a world that is shaped by the needs of late-capitalism and awakes to one where the underlying ideology of society arising from it is fundamentally unchanged. Late-capitalism is the stage upon which Fallout 4 plays and it both intentionally and more often seemingly unintentionally permeates every aspect of the world. Despite the absence of the corporation, capital’s most obvious manifestation, the symptoms of capitalism and its ideologies are reproduced but unchallenged in every other form. The two strains of late-capitalism, neoconservatism and neoliberalism, both make an appearance in the form of the world’s two main settlements. Diamond City is neoconservative, being both moral and regulatory and having encounters that frequently revolve around ideas of controlling sexuality and identity. Goodneighbour is neoliberal, being amoral in its ends and means with inhabitants enjoying drugs, jazz and paying the Sole Survivor to enact state-sanctioned violence against its inhabitants. The institutions of the world also feel familiar. The Brotherhood of Steel is solely concerned with maintaining the status quo, its two goals being the accumulation of technology in order to keep it out of the hands of the populace and destroying every species that didn’t exist prior to the nuclear war. The Institute is concerned with advancing science but keeping themselves hidden from the populace lest they gain access to the same technology. Both institutions are obsessed by ideas of succession and by extension self-perpetuation. These are the same institutions we encounter everyday, from the university to the political party whose dominant instincts are self-preservation at all costs and a resistance to meaningful change. After the dropping of The Bomb the world is frozen into place as the nuclear war brings about capitalism’s only possible endgame. Despite the passing of centuries there are still plenty of canned goods sitting unopened in the ruins of houses, valuable military hardware sitting operational and unused by the side of road and skeletons engaged in the same activities they were the very moment that the world was frozen in time. The Sole Survivor is just as unchanged as the society they rejoin. They are barred from making substantial change on the societal level, instead only able to manifest agency at the level of the individual. This is a necessary feature of the neoliberal ideology whereby the individual is liberated to fulfill their own potential within society as it exists in the present without concern for the rest of the populace or the future. The Sole Survivor exerts their agency primarily at the whim of the world’s inhabitants whose interactions are almost solely transactional, rarely going beyond ‘go there, kill that’. A successful player is one who kills or coerces at the behest of others in the name of maintaining the current state of affairs. There is a quest called “Cleansing the Commonwealth” given by Knight Rhys of the Brotherhood of Steel that requires you to a go to a location and kill everything you find there. Having completed the quest, I returned to Rhys for my reward and was afterwards tasked to go to yet another location and carry out yet another extermination. This happens over and over again without ending, each location repopulated with corpses in waiting ready to achieve their telos. This is a result of one of developer Bethesda Softworks flagship technologies: the Radiant AI, first introduced in their earlier title Oblivion and designed to allow for the automation of quest giving without the need to add additional dialogue or planning. The result of this is a fundamental alienation from any narrative drive. The aim of the quest is to clear an area of undesirables, but they are in fact repopulated each time you are sent back, so there is no change enacted upon the world, only payment made for services rendered. This quest perhaps best represents my own relationship to the game: one of futility and a sense that my own purpose in the world was an afterthought. It would be fair to point out that although the player character is denied the narrative agency to respond to the absurdity of the world, surely it would be unreasonable to expect that the character is able to challenge the game on a metatextual level. I would disagree and presuppose that if the player character is largely denied a distinct personality through extremely limited means of engaging with their environment then the player is reduced to the passive observer of the Sole Survivor, expressing no more agency than in a linear shooter. The issue here is that the responsibility falls to our protagonist to react on our behalf to the calcified world in which they find themselves rather than simply be a tool for the NPCs to enact violence upon one another. The Sole Survivor tells anyone who will listen that they are 200 years old and not even the journalist who interviews them thinks to ask what the world was like before the nuclear war. Conversely, the Sole Survivor never takes any interest in the world and how it came to be destroyed or why it is now overrun with flesh-eating mutants. Neither the Sole Survivor nor the characters who populate Boston ask these questions because they are incapable of imagining a world any different from the one they know, and, as a consequence, are incapable of creating one when capitalism occupies the frontiers of the conceivable. This insistence that the current state of affairs is the only one any reasonable person might desire is the dominant ideology of late capitalism articulated in Margaret Thatcher’s mantra: ‘there is no alternative’. 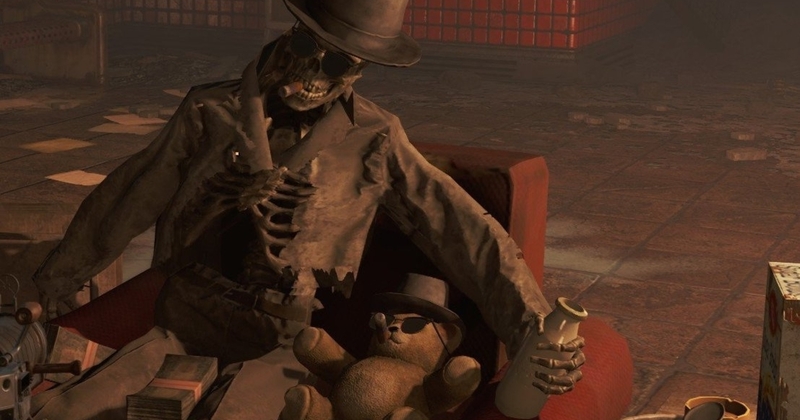 The world of Fallout 4 is a very knowing parody of Fordist capitalism but the implicit ideology of the game has more in common with modern individualistic consumer capitalism than the 1950’s aesthetic lets on. The recurring villain of the franchise is Vault-Tec, a privatised military arm of government acting without oversight, whose pre-war business interests were luring the populace into fallout shelters in order to experiment on them. This was reliant on the continual prospect of nuclear war and it is implied throughout that they knew in advance when it would come. When capital was able to find a way to profit from the destruction of civilisation, it then became inevitable when private interests acted in lieu of government. The still functioning terminals that fill the former office space of the world contain email exchanges detailing the means by which the corporations exploited and experimented on their employees in order to fulfill government contracts, often with no tangible results. These entities resemble Tony Blair’s PFI initiatives undertaken by the likes of Serco and G4S where the perception of results via setting and meeting targets and expanding bureaucracy comes at the expense of the actual operation of public services. If corporations are made out to be so exaggeratedly villainous, essentially placing the blame for the apocalypse with them, it is worth asking how the seeming contradiction between the implicit ideology of Fallout can be held alongside the explicit anti-capitalism manifested in its portrayal of the corporation. It can be argued that this ironic distancing actually feeds rather than challenges capitalism. Robert Pfaller describes this idea as interpassivity, whereby art can fulfill the performative aspect of anti-capitalism on our behalf, allowing us to feel sufficiently distanced from it to be able to feel like we are by extension challenging it ourselves. Slavoj Ẑiẑek writes that ‘cynical distance is just one way to blind ourselves to the structural power of ideological fantasy: even if we do not take things seriously, even if we keep an ironical distance, we are still doing them.’ By only critiquing capitalism at the individual level at the expense of an examination of the larger societal factors, Fallout 4 is able to appear subversive whilst at the same time being thoroughly orthodox. I have no right to expect Bethesda to provide me with effective social commentary, but it’s not too much to ask that when creating a vision of the future enough imagination is used to make that vision fundamentally distinct from the past. This is especially true when so little effort seems to have been made to understand the present. Fredric Jameson cites the observation that ‘it is easier to imagine the end of the world than the end of capitalism,’ and Fallout 4 takes this to its logical conclusion. Bethesda have created a world that, despite being visibly destroyed, is also a manifestation of the permeation of capitalist ideology into every aspect of our lives. What would be scarier: waking up after 200 years to learn that the world had been destroyed, or waking up to find it hadn’t changed at all?